The spectacular change and efficiency in the diagnosis of diseases is the result of pattern recognition and information processing by Neural networks. 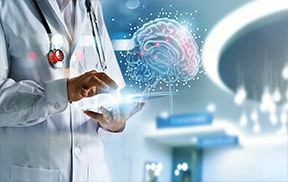 This has led to reasonable growth in Global artificial intelligence market by allowing AI to recognize drug targets and helping in drug design, discovery, identification and screening of molecules instantly; growth of AI does not stop here but has also given boost to Medical imaging that has led to improvement in cancer and tumor diagnosis by deep learning technique. It is now possible to translate data and simulate human intelligence by using ADC (Analog to Digital Conversion) and DSP (Digital Signal Processing). We hope you join us for the webinar and experience the capabilities of Ingenious e-brain as your innovation partner. Declaration- This is a secured message and your details will remain confidential.